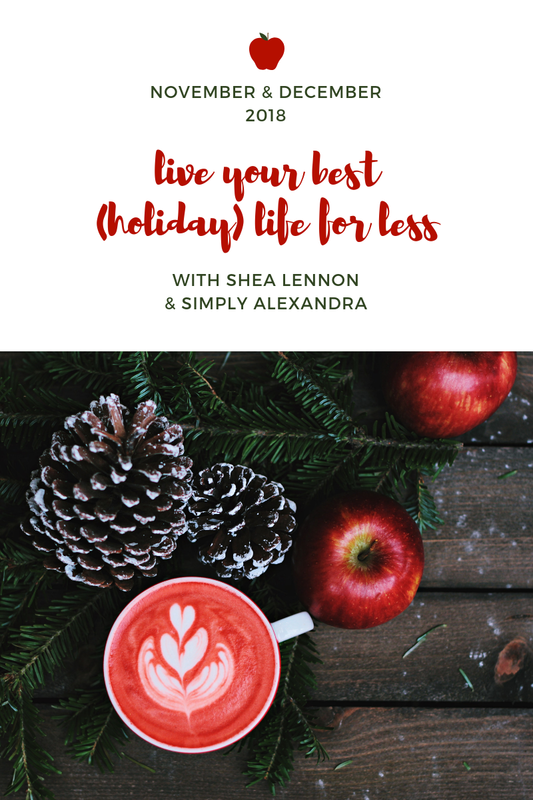 I'm joining Alexandra again this year for our Live Your Best Holiday Life challenge. 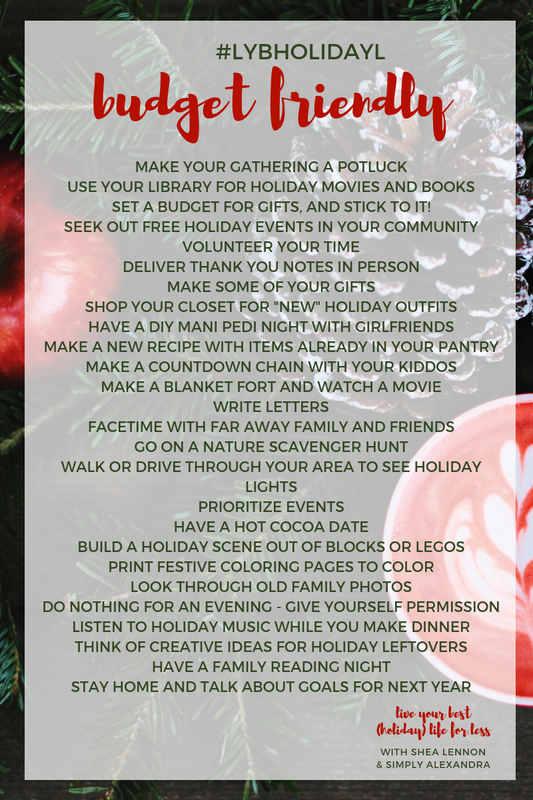 It is something that we created to help make the holiday season a little less stressful and more focused, by intentionally making time for activities that are budget-friendly, self-care centered, and festive. Since we're one month into the challenge--and the holiday season is in full swing--I wanted to provide a little update with how things are going so far. Last year, we included daily prompts for our challenge, whereas this year we wanted to make it a little more laid-back with lists of ideas to use as a jumping off point. I shared on my Instagram Stories that while I like the idea of a more "go with the flow" challenge, it doesn't work very well for me. What's interesting is that Alexandra said she had a similar struggle with the daily prompts! I'm a pretty type-A, to-do list-oriented person, and I need structure in my days. I found that if I don't have something specific to focus on, I don't think of our challenge at all. For me the daily prompts work well, so I've been revisiting last year's prompts and following along when I can. Here are December's prompts from last year if you want to follow along! 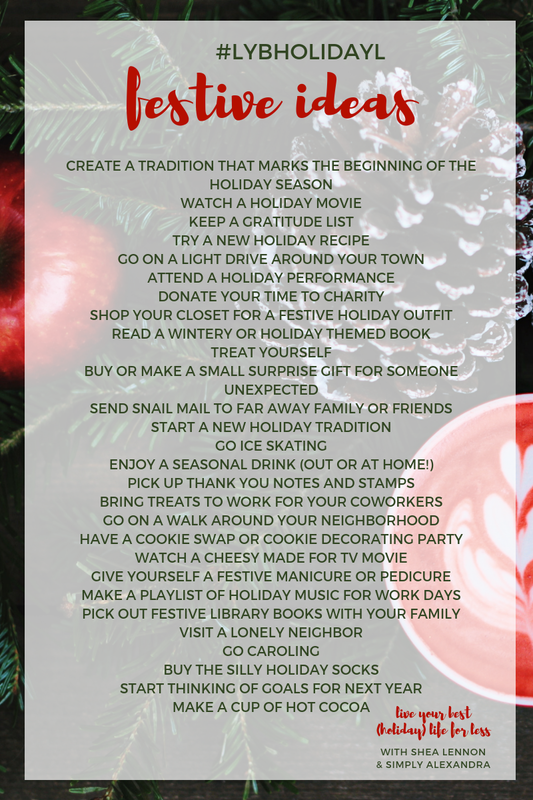 I shared these in my last post as well, but if you're not a daily prompt person, below are the lists for budget-friendly activities, festive ideas, and self-care to try whenever you please. Here are some of the things I've done so far as part of our #LYBHolidayL challenge. Snuggle up and watch a movie on a cold day. We watched Frozen on the day we had a blizzard. Checked in with a far-away loved one. The kids and I FaceTimed with my mom who is in Florida right now. Drank hot cocoa and worked on a Christmas puzzle with Jona. Listened to Christmas music while we decorated the house. Started a dinnertime tradition of saying what we're thankful for during the month of November. Created a cozy space for reading and relaxing in our living room. Lit scented candles to enjoy in the evenings. Went to bed early to read... a lot of nights. Lately I've been trying not to push myself to stay up to get "one more thing" done. 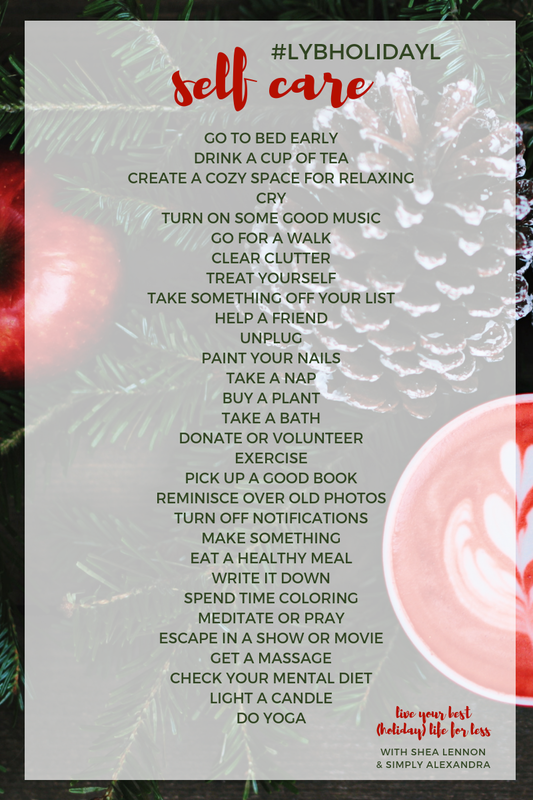 For the month of December, I plan to enjoy the holiday season and try to focus on the things that are most important to me so that I don't feel overwhelmed. 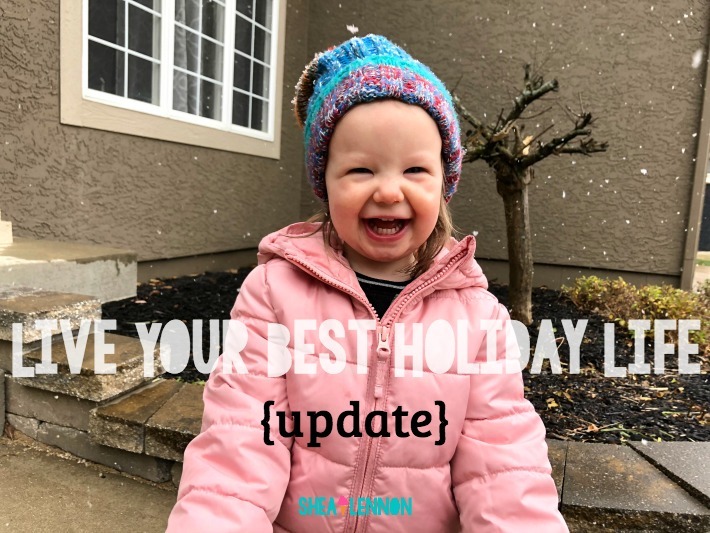 In the spirit of "living my best holiday life," I'm putting my time and effort into a few important things, and letting go of the pressure to do ALL THE HOLIDAY things that come my way. 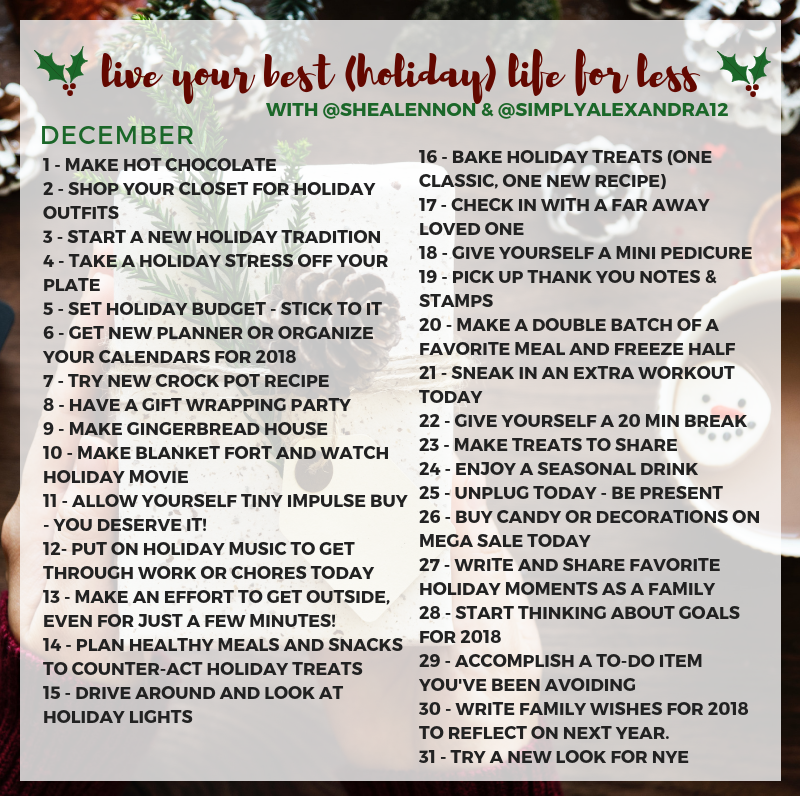 By planning ahead and listing the things I care about the most, it will help me to stay focused and lose that holiday FOMO guilt. Here are the things I plan to focus on. Bake and decorate cookies with Jona and Violet. Take Jona and Violet to visit Santa. Create a simple Advent calendar with fun holiday-centered activities and Bible verses to read. Enjoy the Christmas celebrations we have planned with family and friends. Watch classic Christmas movies, like Rudolph the Red-Nosed Reindeer, The Polar Express, and the original Grinch. Attend church on Christmas Eve and give the kids their special Christmas Eve gifts (PJs and Christmas books). Mail our Christmas cards (I already have them--just need to send!). Create photo gifts for grandparents. What are you focusing on this holiday season? Alexandra and I would love if you joined in our challenge! Be sure to tag us on Instagram (@shealennon and @simplyalexandra12) and use the #LYBHolidayL hashtag.